Changing and handling oil from vehicles and equipment may seem routine to most municipalities, but have you been managing your oils correctly? Is used oil handling and storage nothing new to you? 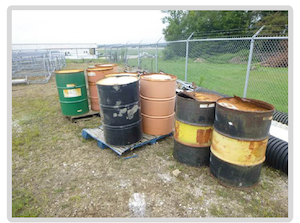 Do you know the storage and handling practices for other chemicals? What about universal and electronic wastes. For municipalities that have been designated a Municipal Separate Storm Sewer System (MS4), we have two resources to help prepare you for the upcoming Municipal Operations and Good Housekeeping Audit by IDEM. 1. First, download our free technical manual: Where's Your Waste? A Municipality's Guide to Handling Used Oil, General Chemicals, Universal Waste and Electronic Waste. 2. Next, register for our free training webinar Oil, Chemical and Waste Handling Training for Utility Employees on November 12 at 10:30am. The webinar will review used oil and chemical management and other waste handling practices for municipalities. A short Q&A session will follow the training. -Collecting and recycling universal waste including bulbs, batteries, mercury-devices and waste pesticides. -Collection and recycling electronic devices including computers, phones and fax machines. The webinar is Wednesday, November 12 at 10:30am. Length: Approximately 1 hour, including Q&A. We hope you'll join us for this event!